File Name: Chun-Li Chung of China. Date of Birth: March 1, 1968. Note: The Street Fighter live-action film gives her the family name Zang. Chun-Li is hyphenated in official game sources. In G.I. Joe's Street Fighter vehicle ad, Chun rhymes with fun. 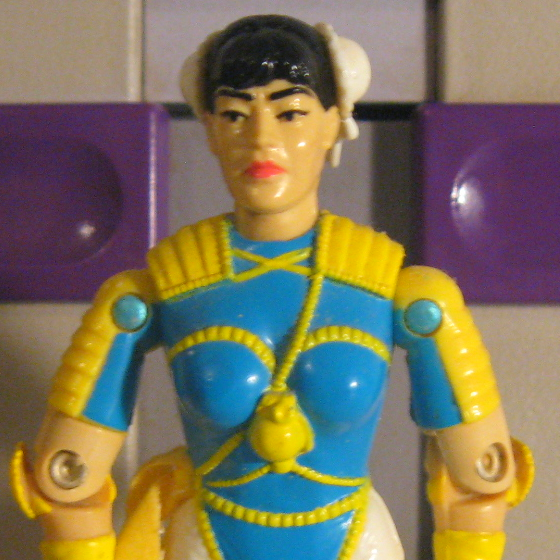 alphabetical: Chuckles << Chun Li >> C.L.A.W.S. See this page for Chun-Li's depiction in the Street Fighter games, animation, and live action. Accessories: neon yellow knife (93 Snake-Eyes's), neon yellow sword (92 Dojo's), neon yellow sword (92 Storm Shadow's), neon yellow sword (93 Snake-Eyes's), neon yellow nunchuks (92 Nunchuk's), two neon yellow handclaws (88 Storm Shadow's), neon yellow figure stand (common). Unlike many of the other contestants, Chun Li has not entered the tournament for personal glory. Instead, she has been secretly tracking the movements of an international smuggling operation known as Shadoloo. The trail has lead [sic] her to the tournament and she now believes that one of the Grand Masters may have been responsible for the disappearance of her father. Stunned by her good looks, opponents often underestimate Chun Li's ability and find themselves flattened by a few well placed kicks. Chun Li's quest for justice guides her life, but at heart she is still a young girl who yearns to live a normal life. Motto: "I'm the strongest woman in the world!" Toy Notes: Featured in the Street Fighter commercial. Chun Li shares Scarlett's attack move. Item #81082. Toy Notes: Chun Li shares Scarlett's attack move. Boxed with Blanka and a recolor of the Dreadnok Thunder Machine. Item #8687. The prototype shown in the 1994 insert catalog has the head of Scarlett (93) minus the ponytail.